Harlow Yancey's grave marker (Mays Lick Cemetery, Mason County Kentucky) - - the tall marker in the back. Harlow Yancey's wife Ann Waller Bullock and at least 4 of their children died in a cholera epidemic in Mason County Kentucky in 1849. Their exact burial location is not known. leaving her husband and 3 children." Based on the above obituary - it would seem she lost various of her children to cholera before her own death. This included children Frances, Ludwell, David, and Thomas and possibly others - all in 1849. Left behind were three children who survived to adulthood: Robert B., Elizabeth and James Jeffries Yancey. Note the original burial may not have been in Mays Lick Cemetery. 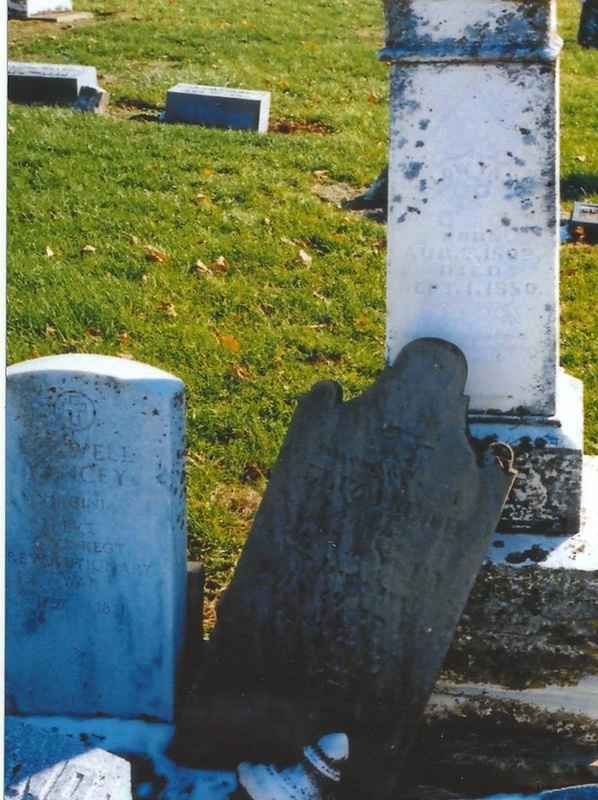 whether that is the case for all these 1849 Yancey deaths is uncertain - but there are no known grave markers for Ann or her children in Mason County. several times, and Kentucky had very high fatality rates. In 1833, cholera killed one tenth of Lexington Kentucky's population in just a few weeks. 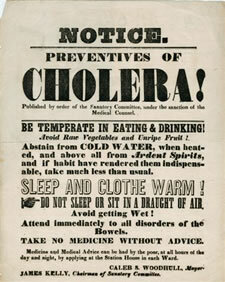 Cholera is an illness caused by a germ invading the bowels. The disease is usually spread by contaminated water supplies. The main symptom is watery diarrhea which leads to fluid depletion and death from dehydration. Cholera has proven one of history's most virulent killers. The cause was first identified in 1854, and it was through cholera epidemics that epidemiologists finally discovered the link between sanitation and public health, which provided the impetus for modern water and sewage systems. Negroes and the Lunatic Asylum (Eastern State Hospital). Under Whites, children were listed by their father’s name and Negroes by their owner. The Lunatic Asylum had residents from several counties and other states. The death rate there was high due to a communication between the water source and sewer under a main building. When this plumbing problem was repaired in the 1850’s, residents’ overall health improved. After being stuck by such a devastating disease, Lexington was no longer deemed immune. The deceased faculty members in the Medical School were not replaced. With the rise of medical schools in Cincinnati and Louisville, Transylvania Medical College dissolved before the Civil War. Lexington prepared for a predicted 1849 cholera wave by enacting ordinances to clean up low lying boggy places. Pigs were no longer allowed to roam free in the streets; although some residents argued that at least the pigs ate the offending garbage. A new privy ordinance decreed that said structures must be at least 2 to 4 feet deep with sides of wood or brick. Which raises the question: How deep and sturdy were the privies during the 1833 epidemic?
" . . . so you are the little woman who wrote the book that started this great war." 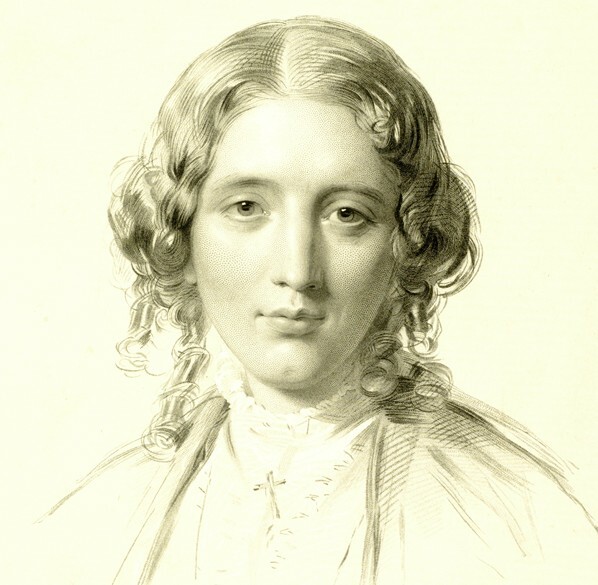 who wrote the famous "Uncle Toms Cabin"
Harriet's son Charley who died in 1849. Today is a rather dejecting day. I don't particularly feel like talking about it because my heart can barely take all the emotion of today. I am overwhelmed with confusion a sadness. Today my eighteen month old son died of Cholera. As I sat cradling him in my arms for the last minutes, the last breath of his short life, I could see the life being sucked right out of his small, frail body. His eyes were glassy and his skin was as dry as the dust on my boots. It felt as if the life was being sucked out of me the longer I sat there staring into his blank expression. He seemed so disconnected; So helpless. That was one of the hardest things I have ever done. No way to help, all I could do was sit there and accept that my child was breathing his last breaths. I referred to him as my sunshine child. At only one year and six months he lit up my day like the sun fills the sky with light and gives everyone a feeling of warmth. I will never forget my baby boy. Having experienced losing someone so close to me I can sympathize with all the poor, powerless slaves at the unjust auctions. You will always be in my heart Samuel Charles Stowe. 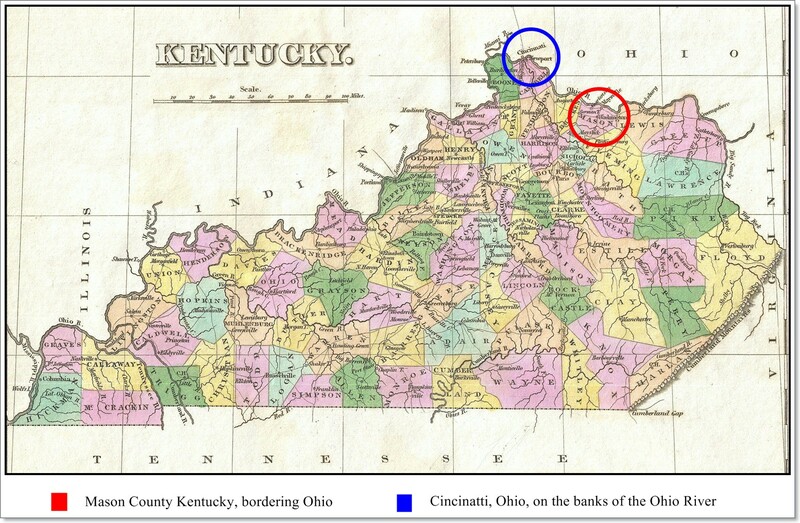 Map below showing location of where Harlow Yancey family lived in Mason County - as compared to where Harriet Beecher Stowe lived and where her son died from Cholera in Cincinatti in 1849. Six of Stowe's seven children were born in Cincinnati, and in the summer of 1849, Stowe experienced for the first time the sorrow many 19th-century parents knew when her 18-month old son, Samuel Charles Stowe, died of cholera. 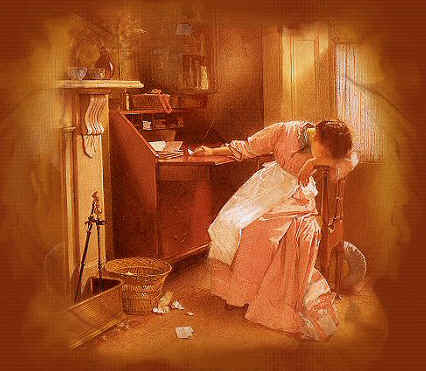 Stowe later credited that crushing pain as one of the inspirations for Uncle Tom's Cabin because it helped her understand the pain enslaved mothers felt when their children were taken from them to be sold. The first installment of Uncle Tom's Cabin appeared on June 5, 1851 in the anti-slavery newspaper, The National Era. Stowe enlisted friends and family to send her information and she scoured freedom narratives and anti-slavery newspapers for first hand accounts as she composed her story. In 1852 the serial was published as a two volume book. Uncle Tom's Cabin was a best seller in the United States, Britian, Europe, Asia, and translated into over 60 languages. 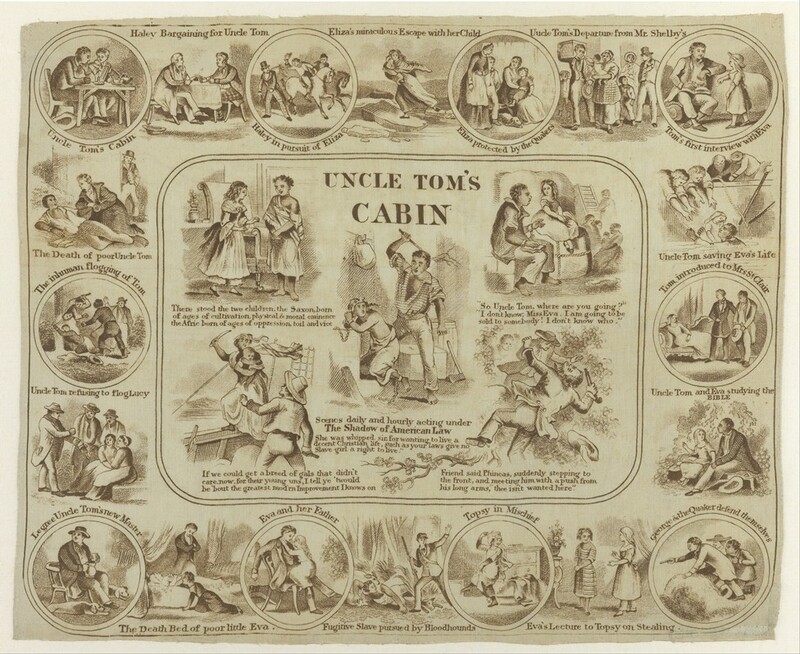 Uncle Tom's Cabin was a runaway best-seller, selling 10,000 copies in the United States in its first week; 300,000 in the first year; and in Great Britain, 1.5 million copies in one year.